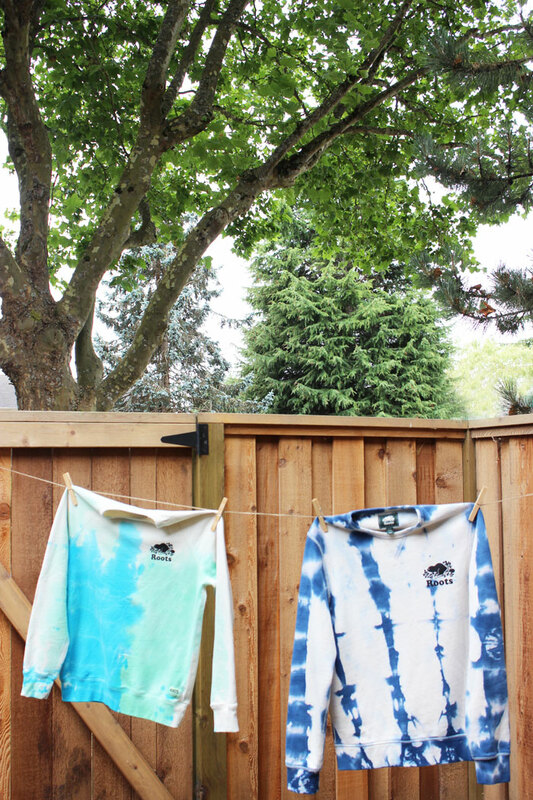 Weekend Project | Dye It! 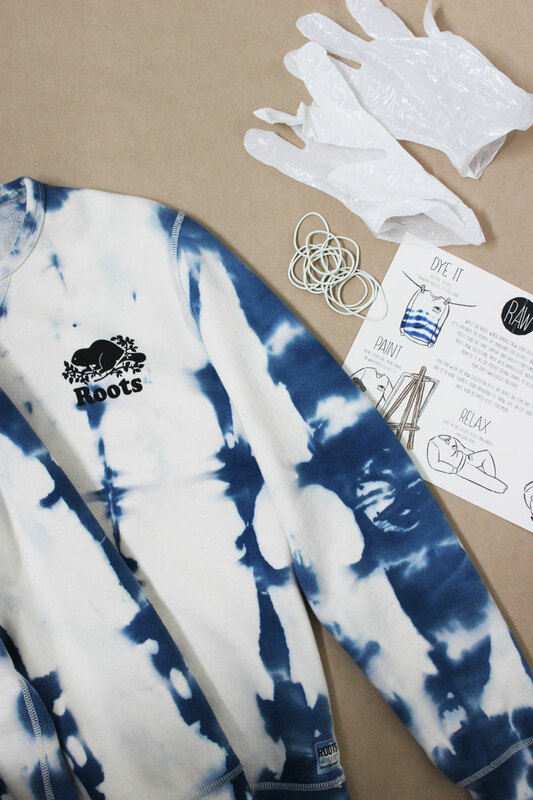 This post is in collaboration with Roots Canada and their Roots Raw Collection. We've always wanted to try our hand at dyeing (especially shibori-style) and its funny how sometimes a little nudge will show you the way. We were sent a nice package from our friends at Roots last week, asking us to try our hand at dyeing the Roots Raw Collection. 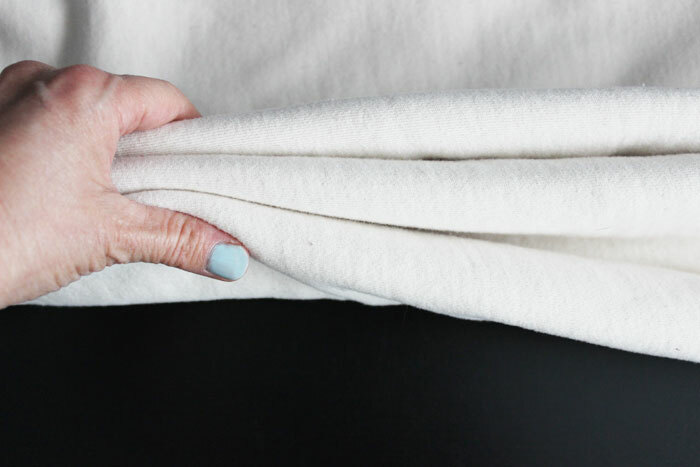 An unprocessed, undyed fleece, which makes for a perfect blank canvas to design your very own classic pullover. So we spent a bit of time learning and through a bit of trial and error, are now completely hooked and want to dye everything in sight! 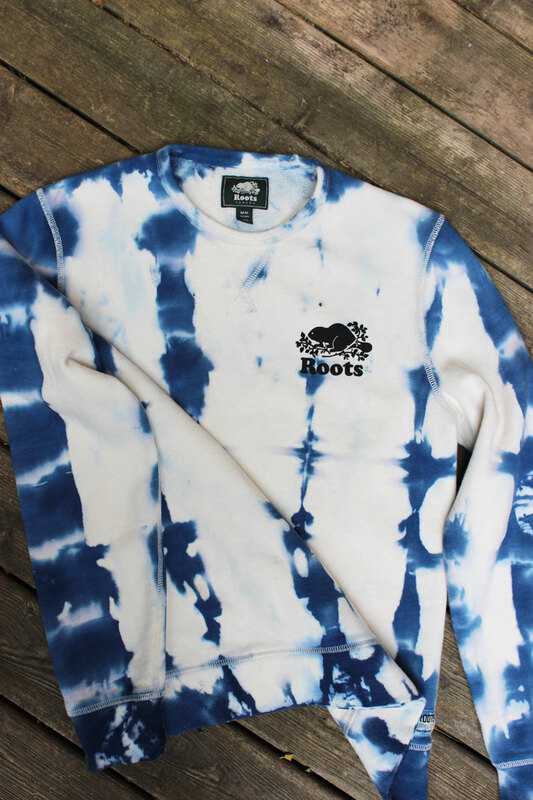 Loved how the Roots Raw Collection sweatshirts turned out —we made two versions, one shibori-style and the other like a watercolour. If you like to know how we made them, click below to find out! Wash and dry your shirt first. Cover your work area with a plastic table cloth or garbage bags. 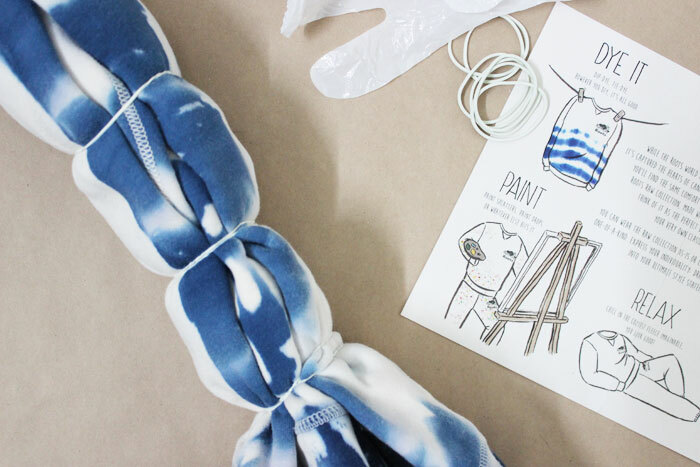 Lay out your shirt (or whatever you're going to dye) and start to fold - accordian style. The thicker the fold and material the thicker the outcome. Wrap elastic bands about 2 inches apart all the way along the shirt. Put on rubber gloves. Fill water half way in your dye bottle and give it a good shake (with the lid on of course). Then fill the rest of the bottle up to the line indicated on the bottle. Make sure your fabric is wet first before dying, otherwise the dye won't run like you want it to. We just dipped ours into a sink and squeezed out the excess. Start to squirt the dye onto the fabric in each section, ensuring not to squirt directly onto the elastic covered area. The dye will spread a bit and you want to leave about a half inch or so on each side clear. Follow the same through each section. Turn over gently, and do the other side the same. Wrap in plastic wrap to keep it moist. Let sit for 6 - 8 hours. We did 7. Mix dye from instructions in the bottle and squirt onto each section - making sure not to spray directly all the way on each elastic. Leave the elastic area a bit clear of dye. 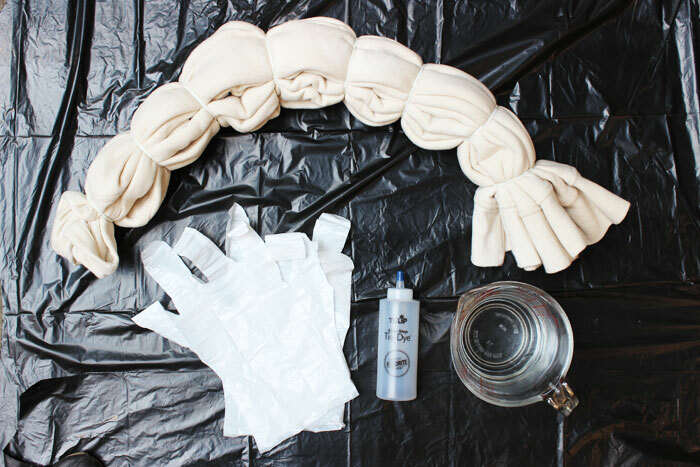 Unwrap elastic bands and rinse out excess dye. Wash in machine with soap and dry. Marvel at your beautiful dye job! This shirt is going to be a fave for sure for the cooler summer nights by the campfire! This one is a little more trickier, but still once you get the knack, still easy. We suggest practicing first on a piece of scrap material to get the idea. Wash your shirt first. Leave wet. Cover your work area with a plastic table cloth or garbage bags. Lay out your shirt. Put on rubber gloves. Fill water half way in your dye bottle and give it a good shake (with the lid on of course). Then fill the rest of the bottle up to the line indicated on the bottle. Make sure your fabric is wet first before dying, otherwise the dye won't run like you want it to. Fill two containers with a little bit of each colour of dye to dip your paint brushes into. 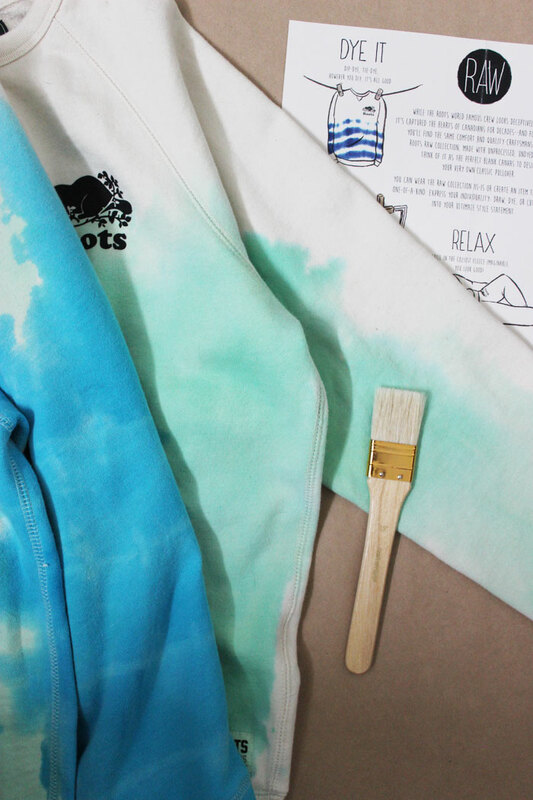 Dip your paintbrush into one of the colours and start to dab (like stenciling dabbing) the colour onto the fabric (and one side of the shirt). You should see the colour spreading a bit. If you don't, you can spray a little bit of water to make the colour spread a little better. Keep dabbing covering the areas you like. We suggest try dabbing to make it look like clouds to get the effect we have. Careful when the two colours meet, not to overlap too much, otherwise you might get a muddy colour you might not want. We left the backside blank, as it would be too tricky to turn over and not mess up the colours. 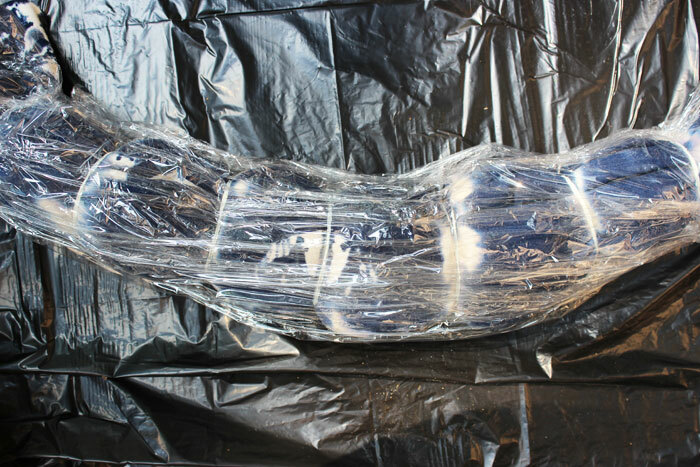 Cover with plastic wrap and let sit for 6 - 8 hours. Rinse out excess dye and then wash with soap and dry in a dryer. And that's it! So easy and so fun! We love them! You should totally make one! 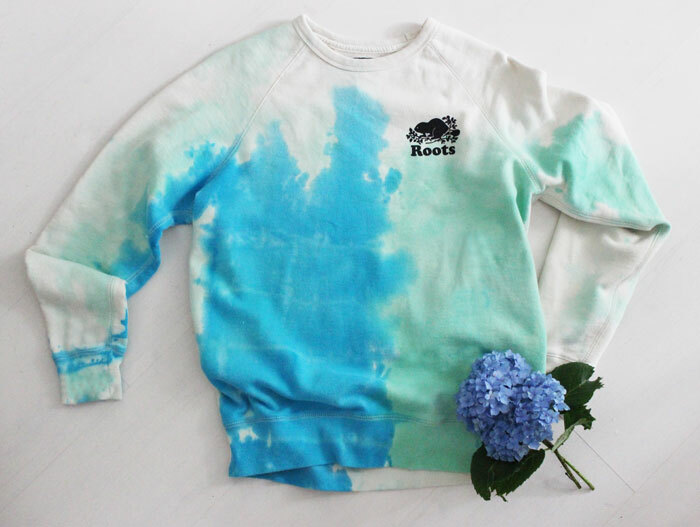 This post is in collaboration with Roots Canada and their Roots Raw Collection. While the Roots world famous crew looks deceptively simple, it's captured the hearts of Canadians for decades—and for good reason. You'll find the same comfort and quality craftmanship in their Roots Raw Collection, made with unprocessed, undyed fleece. Think of it as the perfect blank canvas to design your very own classic pullover. You can wear the raw collection as-is or create an item that is truly one-of-a-kind. Epress your individuality; draw, dye, or cut your crew into your ultimate style statement!